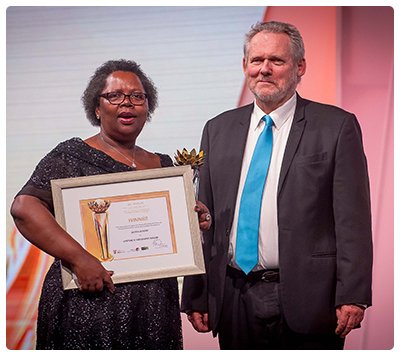 Minister of Trade and Industry Dr Rob Davies tonight bestowed the Lifetime Achiever Award on Ms Gloria Serobe, Executive Director of WIPHOLD and CEO of Wipcapital, at the 4th Annual South African Premier Awards hosted at the Sandton Convention Centre in Johannesburg. Ms Serobe has more than 30 years of experience in leading public and private domestic and multinational institutions. The annual South African Premier Business Awards, held under the theme “Rewarding Business Excellence” are a key feature on the Department of Trade and Industry’s (the dti) calendar and celebrate national corporate excellence and success. The Awards are jointly hosted by the Department of Trade and Industry, Brand South Africa and Proudly South African. Tsogo Sun, Old Mutual and the Johannesburg Stock Exchange are sponsors to the Awards.